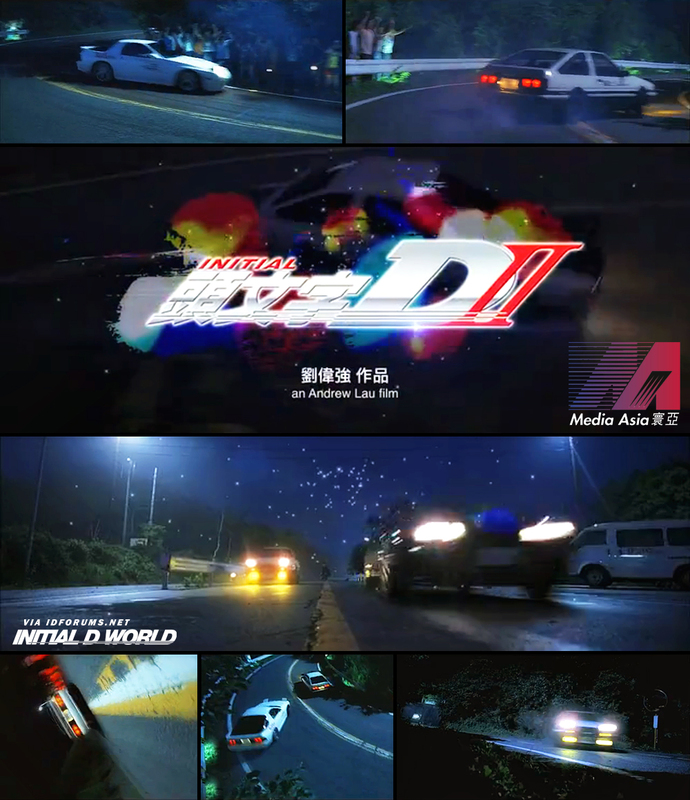 Initial D Live Action Movie 2 News: 寰亞電影 Media Asia Distribution Ltd, a Hong Kong films production company and distributor, released a 20th anniversary promotional clip yesterday highlighting all of the movies they released in the past two decades. Media Asia Entertainment Group is the company that made Initial D Live Action movie back in 2005. The movie was directed by Andrew Lau (劉偉強) and starred many big stars such as Jay Chou, Edison Chen, Shawn Yue and Anthony Wong. There had always been rumors of a second Live Action movie in the making, but nothing solid ever came to light, until yesterday of course. Jay Chou's assistant has already confirmed that he will be both acting in and directing Initial D 2. As you can see from the cast list, the storyline will be most likely taking place in Initial D Fourth Stage where Project.D challenges the Purple Shadow. Besides the confirmation that the film is being in production, there is no other further information, but it's believed that the movie will be released in 2015, on the 20th year since the debut of the first Initial D manga volume. Image size reduced, original size: 1000 x 1160. Click here to view the image in its original dimension. I'm so excited!! it seems like a lot is happening for Initial D this year. Why do you think? Is Initial D still as popular as it used to be? Excellent. I can't wait for more news. it seems like a lot is happening for Initial D this year. Why do you think? Is Initial D still as popular as it used to be? It's probably because the series ended last year. OH MAN! Edison Chen is back as the Takahashi brothers? This movie will be good regardless. I've been waiting years for this! With all this Initial D related news, now is a good time to be an Initial D fan. You know, it's been like 10 years. Unless they have all aged well, I have to imagine they're gonna look pretty different. They're Asians. They don't age. Take it from me. I'm 21 and people still think I look like a high school student. The manga ended last year. - Details: Verbal warning has been issued to this post by kyonpalm on Mar 26 2014, 02:27 PM. It's okay, I feel for you. I did the same thing too once. Nice !! It''s fine that they aged as they looked aged in the series too compared to when it was the first movie. So Ryosuke probably taking over Keisuke's role, hopefully they use the FD ! Wonder how they will handle Takumi's victory over Joshima, wouldn't be that good if the climax/ending of the film ended with Takumi's messing up his car and winning when Joshima gets sick..
Super excited Jay Chou is director, his first directed movie Secret is absolutely amazing and seccond one Rooftop ain't bad either. Meh, Simon Yam as Joshima and Chen Dao Ming as Hoshino. That's as bad as having Jay Chou as Takumi. Can u guys clear this up for me. So there's gona be a final stage , A anime movie, and now a new live action movie? Not sure if this official, seen this floating around FB. So they decided to add Keisuke. Image size reduced, original size: 694 x 960. Click here to view the image in its original dimension. It's not official, and Media Asia has even gone as far as listing Edison Chen as playing "Ryosuke Takahashi / Keisuke Takahashi" since the first film basically melded the two characters together into one. Kogashiwa has also not been confirmed. There is nothing new about this film since it was originally announced. I hadn't actually considered how they would deal with Keisuke's character in the sequel, considering he was merged with Ryosuke in the first. I guess they're going to change the story so that Project D's two aces are Takumi and Ryosuke. Ekin Cheng as Wataru seems decent but a bit too old though. Also, I think Keisuke's role was more merged with Nakazato than Ryosuke seeing it's the first rival Takumi race against. The Purple Shadow cast doesn't look too good. Kogashiwa's actor looks nothing like Kogashiwa and Keisuke's actor looks doesn't do justice for Keisuke unless the actor gets thinner. There isn't going to be a Keisuke because his charcter is mixed with Nakazto and Ryosuke. I already said that. Other people already said that. The director and star of the movie already said that. PERRY. BUILD A THUMBS UP BUTTON FOR POSTS RIGHT NOW.